Eficode's previous office used to have a small laboratory space. After moving to Kamppi, the old home for personal projects and new inventions got new walls. 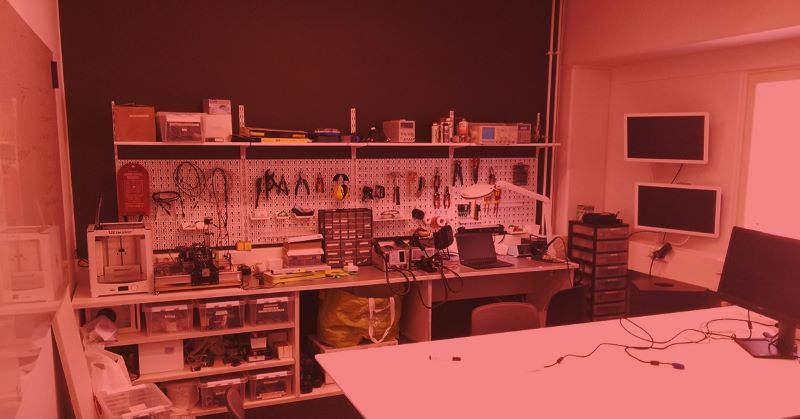 Eficode's old office at Kuortaneenkatu used to have a small electronics and hobby project laboratory space. It was created at the end of 2015 and beginning 2016 and named "Efitronics lab". It was a using a few work desks and shelving attached to the wall to house all the hardware and parts. When the company started to plan moving to a larger office, we decided that Efitronics lab would move to a meeting room on the 6th floor of new Headquarters. Having the lab in a room meant it could be closed for sound and air isolation. It was a welcome improvement over sharing the lab space with other co-workers. It was not the only planned improvement however. Inspired by existing workspaces and labs of Helsinki, a plan arose to build a workbench with shelves and a desk to suit the new room. As you can see in the picture the workbench was planned to be at the back wall of the room, along the power and cable strip. It would be around 80cm tall, not to cover the power sockets, and as wide as the room till the bend in the power strip - less than 340cm. The materials for the workbench would be 27mm thick plywood, lots of screws, L-irons and white wood lacquer. First of course came cutting, painting and sanding of the elements. All the cutting was done with a hand-held circular saw – as an IT company, we don’t have many woodworking tools – which made the cutting slightly challenging. Painting the furniture with 2-3 layers came with similar challenge owing mostly to our lack of experience. In the picture there's a few legs, top desk and a shelf drying in the cellar. When most of the pieces were ready, assembly in the room started. Some of the remaining pieces, like the right-side leg of the table would be cut after properly checking the table's height. These last-moment adjustments were necessary as the cuts done with circular saw would be sometimes even 0.5cm off. Bubble levels and measuring tapes were quite frequently in use to assure the end result was stable. In addition, reciprocating saw was used to cut out holes for cables and a lamp holder in the tabletop. Aside from building a workbench, a drill came in handy when installing shelves on the wall and VESA mounts for screens. All those operations took two people two weekends to complete. It was ready when the 6th floor opened. We are proud to have built a few improvements onto the furniture over the old lab. The work area sports connectors for two screens mounted on the nearby wall, making work with headless computers like Raspberry Pis a breeze. Similarly, plenty of power is available in a wall-mounted power strip, as well as always-on USB connectors peeking from a cable hole at the side of the table. You may note, that some shelves are not yet mounted, but that can come later. So far, the lab has been used in company's "Ihan Hyva Paiva" hackathon by two teams, and by various employees for personal projects. The room also functions as a meeting room. The dual purpose actually helps, since as a meeting room the lab space can be booked for when larger builds are in progress. Would you like to have this kind of laboratory at your own office? If yes, we have a solution for you! Visit https://www.eficode.com/careers, read more about our open positions, and send us your open or targeted application. Sooner than you can even imagine, you might find yourself from our office and lab. See you soon! Visa, Eficode's Innovation Director, is a business oriented technologist with eyes set firmly in the future. He has a broad knowledge of various technologies and likes to think about applications in business to improve our daily lives, at work and at home.